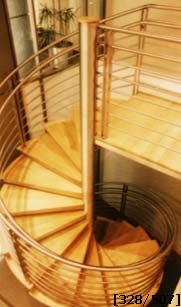 This 96"diameter spiral staircase is made out of # 304 grade stainless steel material with birch wood. The Spiral stair has a special rail system. The outside handrail is 42" from the tread nosing up to the top of the handrail with an inside grab rail 36" from the nosing to the top of the grab rail. Both handrails are made out of 1 1/2" round, 16 gauge, stainless steel tubing. The intermediate rails are spaced less than 4" apart and made of 3/4" rd solid stainless steel rod. This spiral staircase has two posts at every quarter turn. The posts are made out of 1/2"x 2" stainless steel bar spaced 2" apart. The spiral stair treads and landing are made out of 3/16" stainless steel bent pan type with a 1" birch wood overlay with nosing. This spiral stair model has railing on both sides of the landing with the outer rail at 42" high and the inner grab rail at 36" high. The center column is a 6" ID schedule 40 round pipe. All of the stainless steel material has a # 4 brush finish with the wood finish done by others.